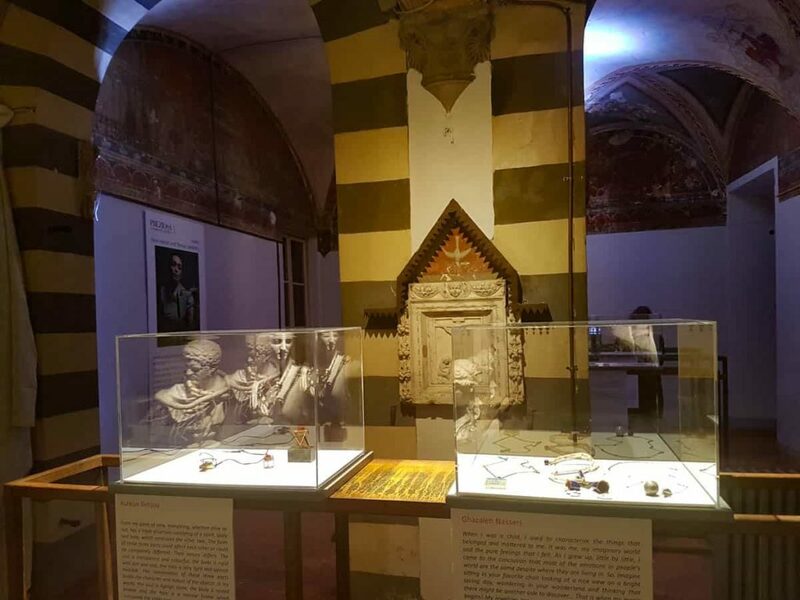 Jwahr: New Iranian and Persian Jewellery is an exhibition of work drawn from Aria Gallery and presented at Preziosa, as part of Florence Jewellery Week, 2017. 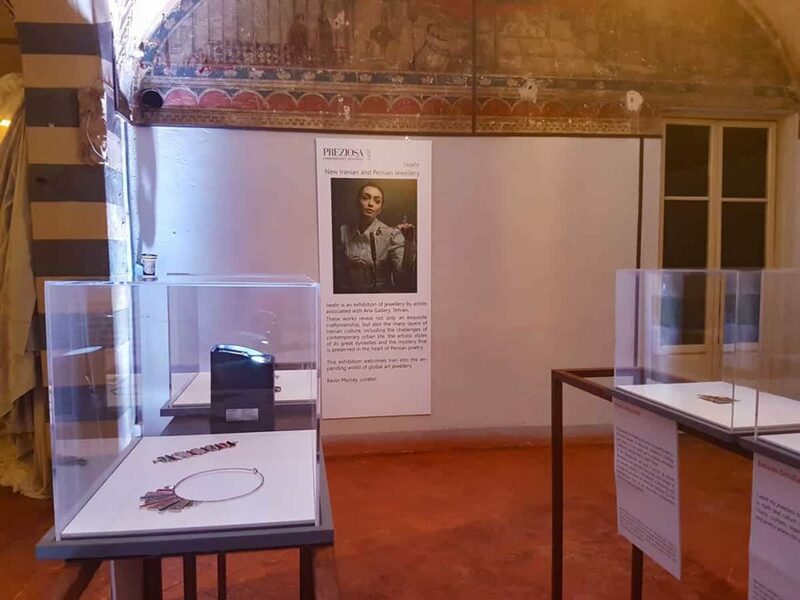 This exhibition is a selection of work who have shown at Aria Gallery in Tehran. 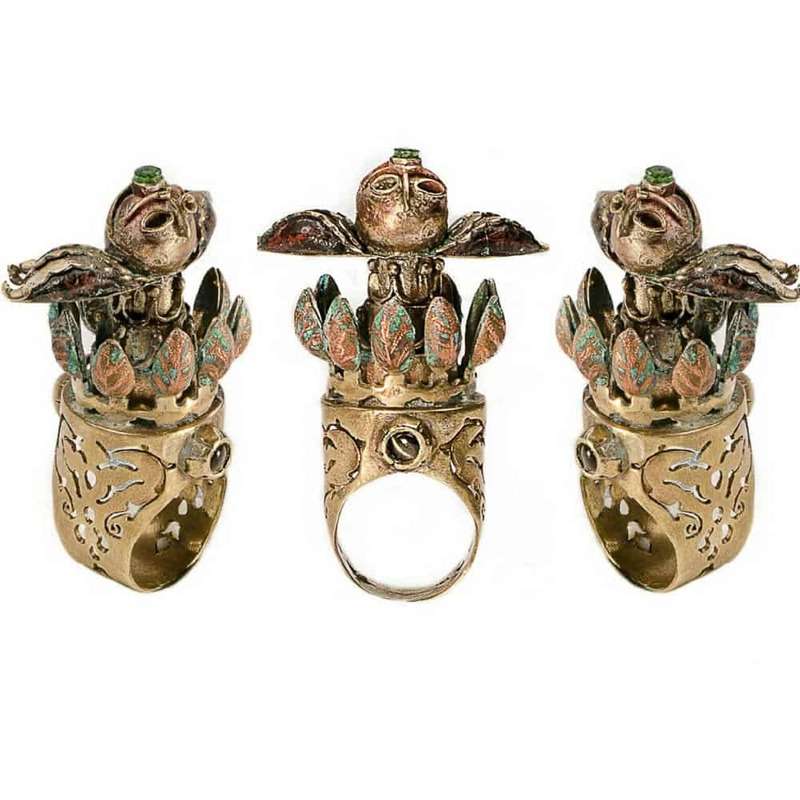 The work heralds a new generation of artists in the field of global art jewellery. 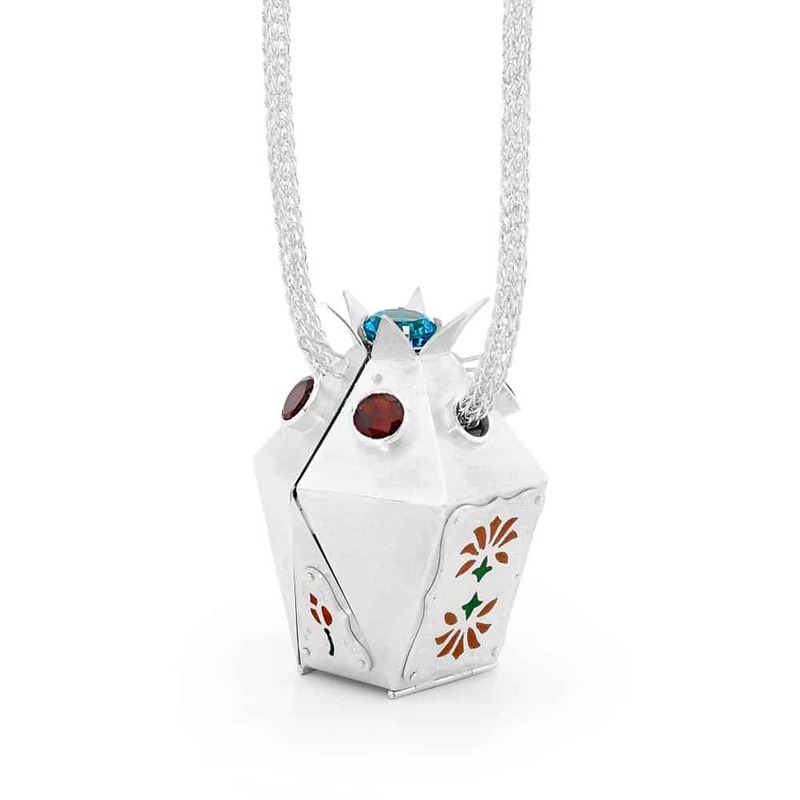 Their work shows the capacity of jewellery to give personal meaning to lost traditions and stories. I believe our body is a machine with different parts just like car, phone, television and so on, and in this particular collection my focus was on cars. In the future, I am going to create other series with different machines. 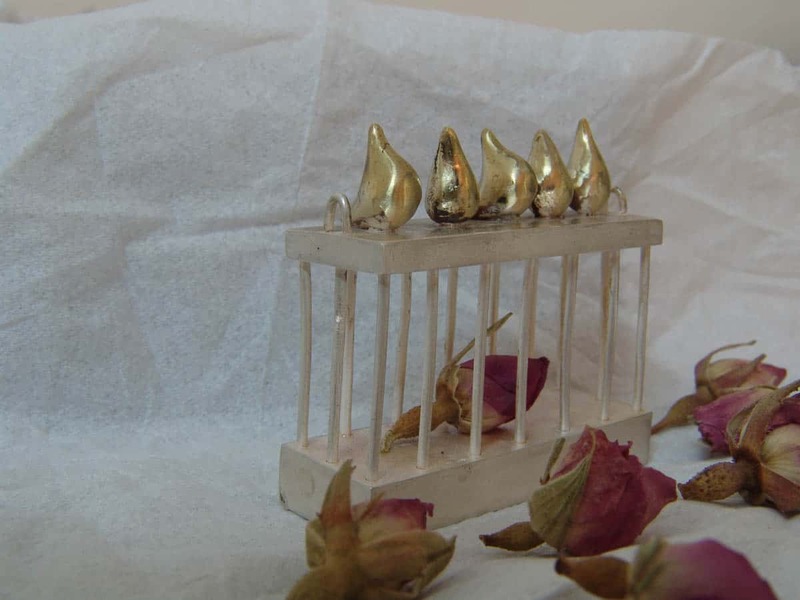 Anahita Anasseri is an Iranian sculptor who studied both Zoology and Industrial design. 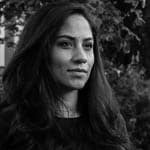 She studied design at Azad Art and Architecture University of Tehran. She was born in 1978 and as an industrial designer, she appreciates all machines, especially cars. From my point of view, everything, whether alive or not, has a triple structure consisting of a spirit, body and halo, which embraces the other two. The form of these three parts could affect each other or could be completely different. Their nature differs. The soul is transparent and colourful; the body is rigid with dirt and rust; the halo is very light and almost invisible. The combination of these three parts builds the character and nature of the objects. In my works, the soul is Aghigh stone, the body is rusted bronze and the halo is a narrow frame which surrounds the other two. Ashkan Behjou is an artist living and work in Tehran. He was born in 1987. He completed a MA in Architecture at the University of Tehran. 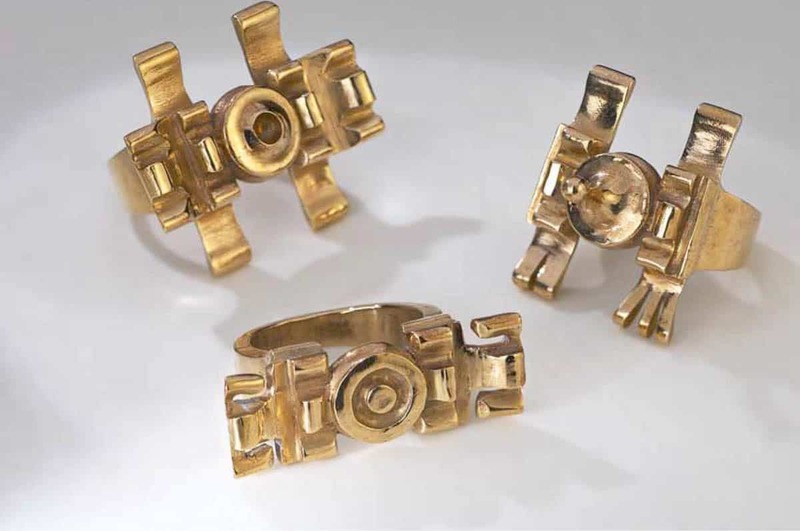 Subsequent to that he attended in jewellery design courses at Mahe Mehr institute held by Parviz Tanavoli. 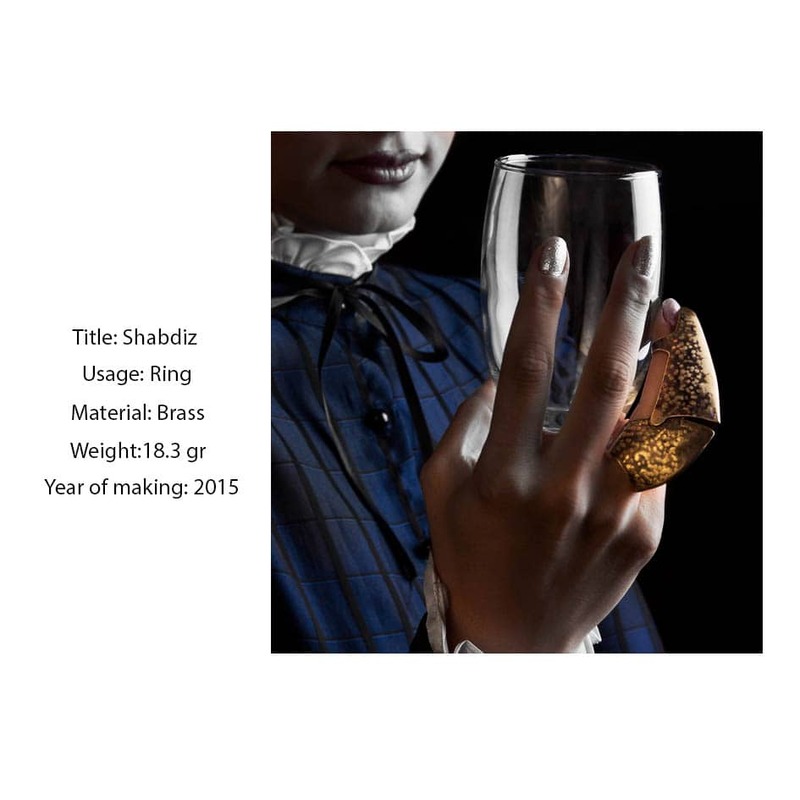 At 2016, he participated in Tehran’s first contemporary artistic jewellery exhibition. 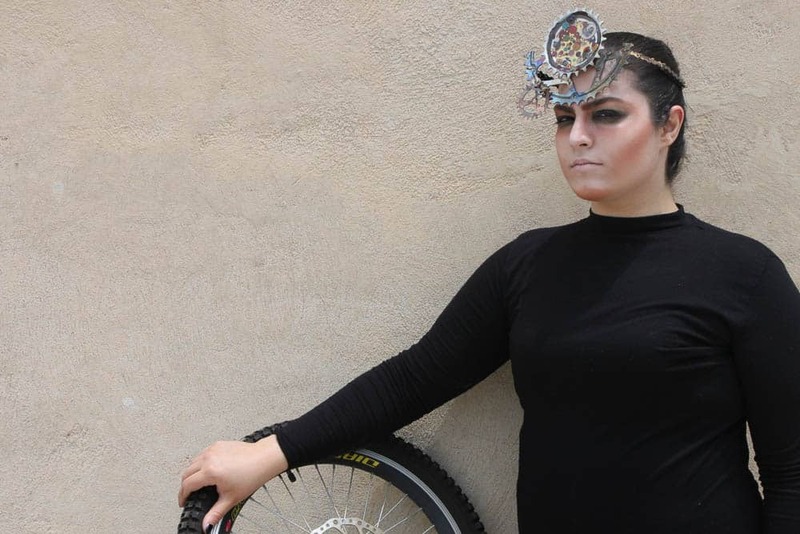 This is a set of art body jewellery which is inspired by bicycle gears. 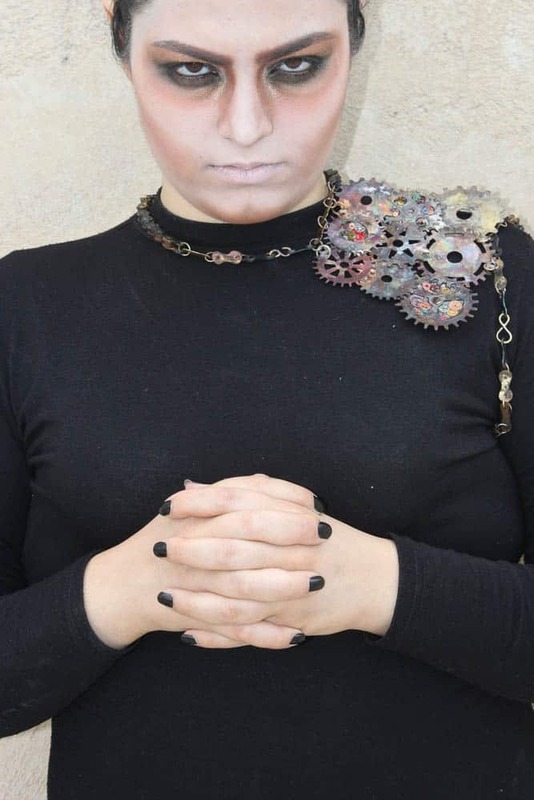 The well organised cooperation of these gears and also using useless gears lead me to design and mix them with arts. 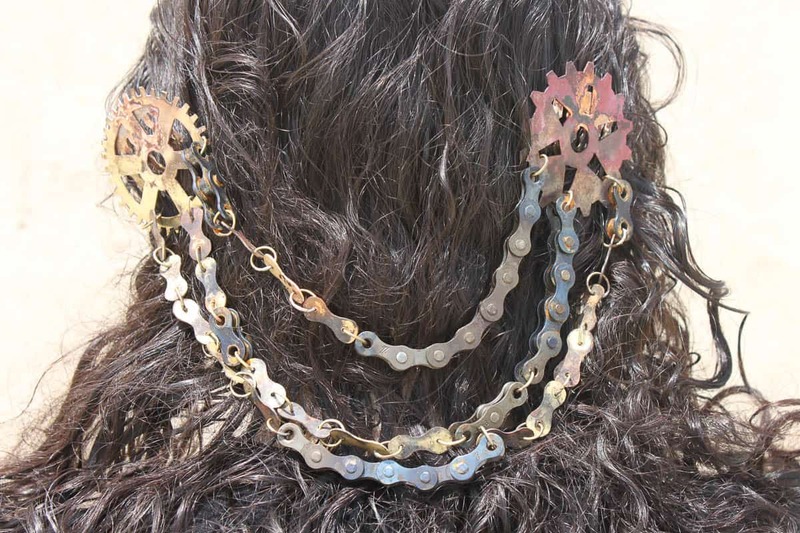 This jewellery is from a bike that I loved very much, but I had to replace it. I didn’t want to waste anything, so I thought I could use it as an art work. 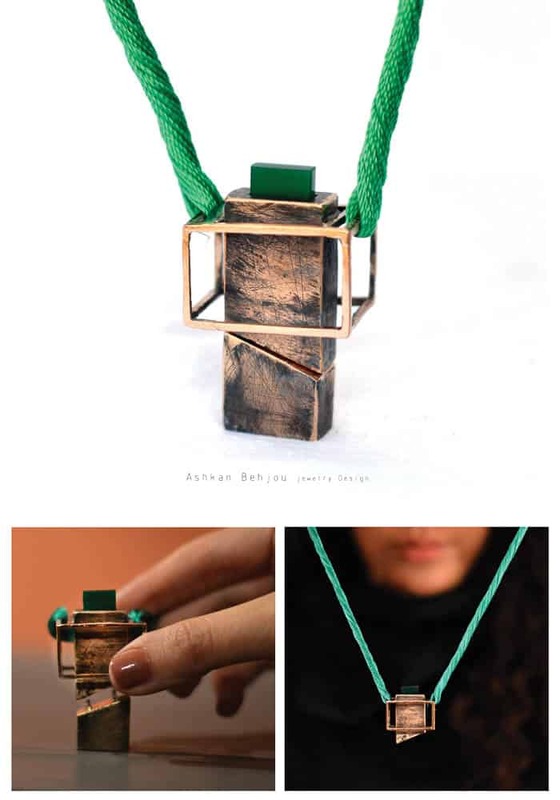 Atousa Mokhaberi was born in 1994 and completed a BA in craft from Alzahra University in Tehran. 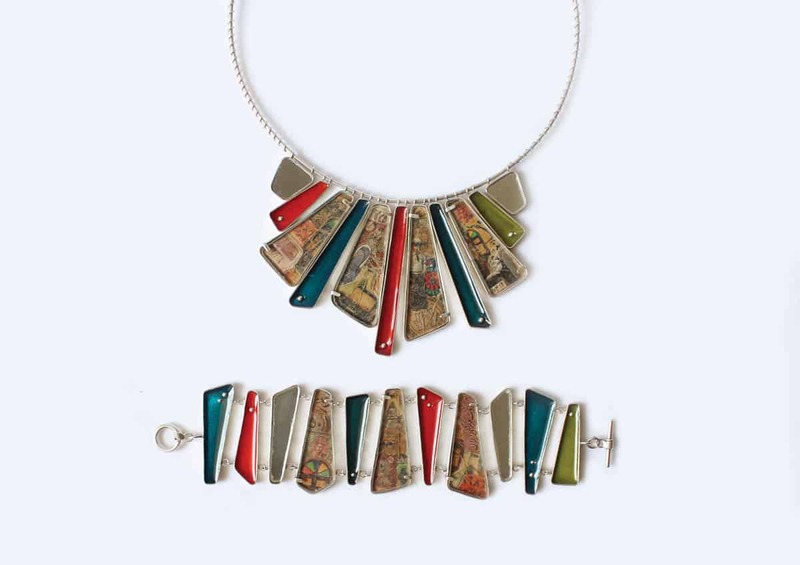 She has worked in various art fields with a focus on jewellery, leather and ceramics. 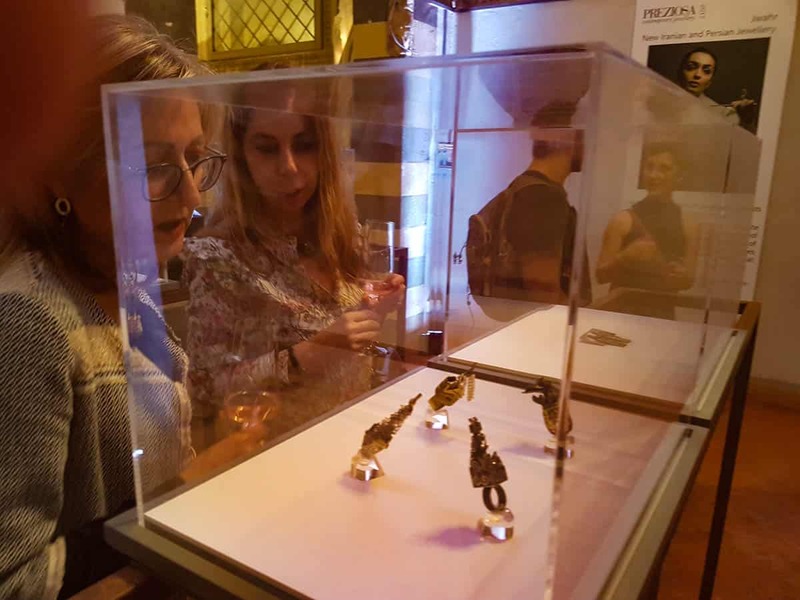 I want my jewellery to show the role of the women in myth and culture in Iran and I refer to Iranian rituals, customs, legends, mythology, the literature and poetry where the woman has a central role. Sepandarmaz, the goddess of the Earth, is protector and advocate of the earth in ancient Persia. Sepandarmazgan is the name of the celebration for the earth that be held for the commemoration of the earth and the woman in ancient Persia. This jewel is the symbol of an old dream for the establishment of everlasting peace between man and man, and man and nature on the earth. The goddess of the earth is the occult symbol of this kind of wish. 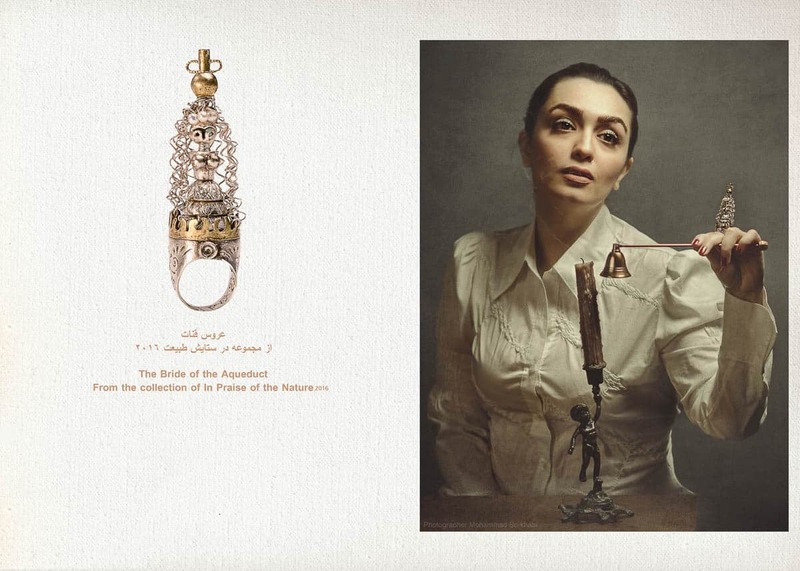 Bride of the Aqueduct refers to a ceremony that was developed to improve the conditions in the arid regions of Iran. A widow is married to the aqueduct ensure and protect the supply of water. The woman must swim once a week in water of the aqueduct. Qanat bride ceremony is the remains of the ancient custom of sacrifice for water (Anahitaisme ritual). Woman is considered as a symbol of birth and fertility in relation to water and she also makes water fertile and creative. 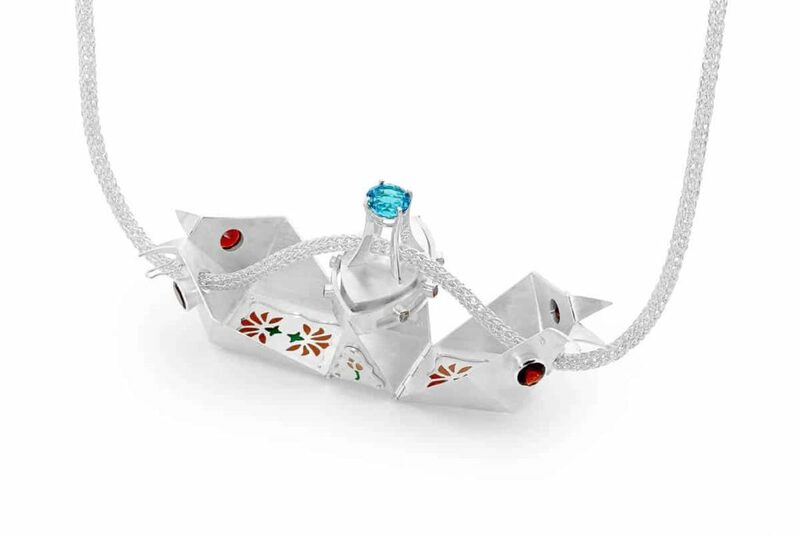 The purpose of this jewellery is to emphasise the importance of water, particularly in Iran. It also highlights the respect that our past culture has granted for women, life, water, and reclamation. Tehran Lady: According to our mythology, the city is like a mother that protects her children. 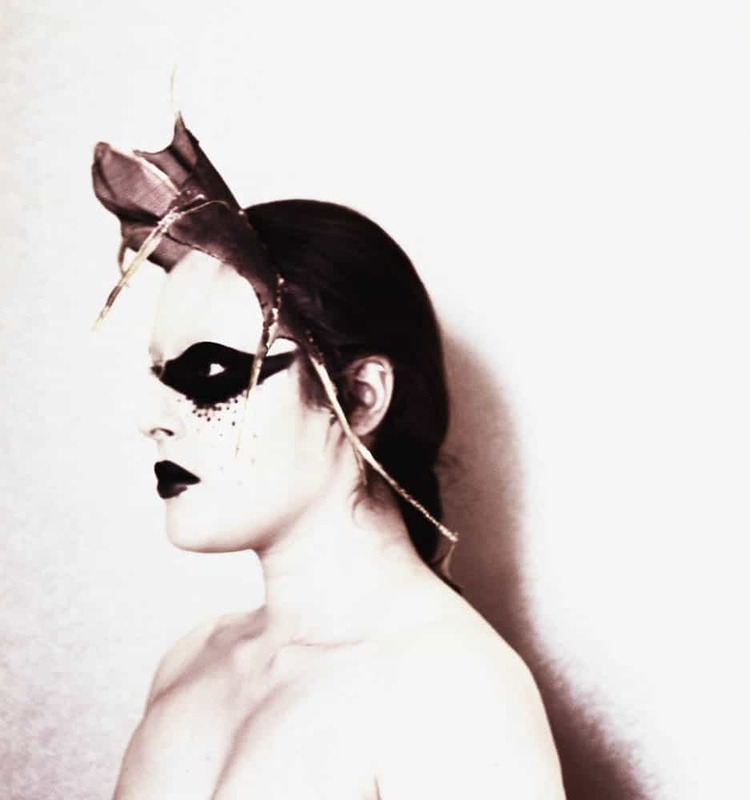 Female deities, such as Anahita, wear a crown-like castle or city fort on their head. The “Myth of Tehran” involves a dualism of good and evil, in which the renovated Iranian capital is placed in a religious context. 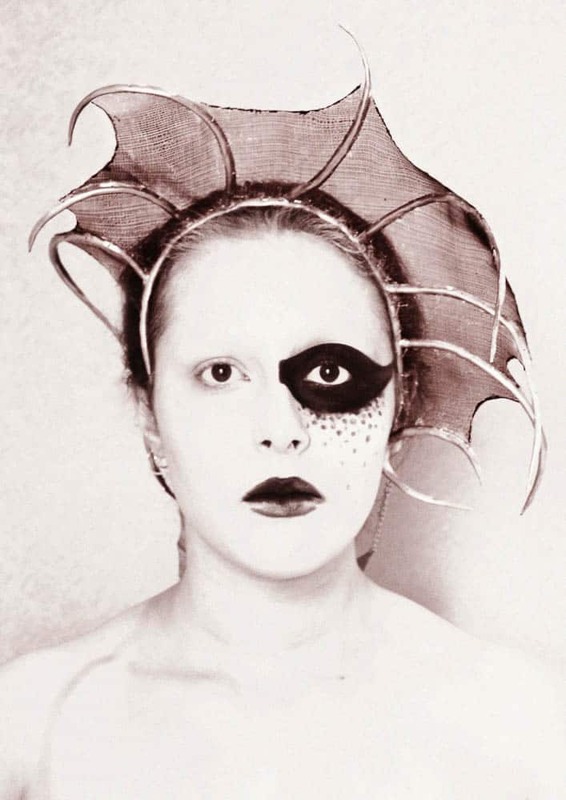 Our culture is characterised by an everlasting struggle between good and evil or Ahura and Ahriman. In popular belief, the city, and particularly Tehran, is a centre of sin, destruction and filth. By contrast, the village or town is a symbol of purity and divine nature. This belief is a reaction against modernity. However, the culture of Iran is based on the Trinity, not dualism. This Trinity comes from the myth of Zurvan, in which good and evil are created from a finite time. In the past, duality has been a pretext for the dominators (rulers and the powerful) to increase their control over the people. 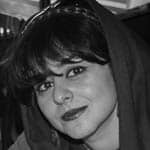 Baharak Omidfar has MA in Art Research from Azad University of Tehran and BA in Handicrafts from Semnan University. She designs and makes jewellery and teaches art jewellery in her design studio in Mashhad since 2007. 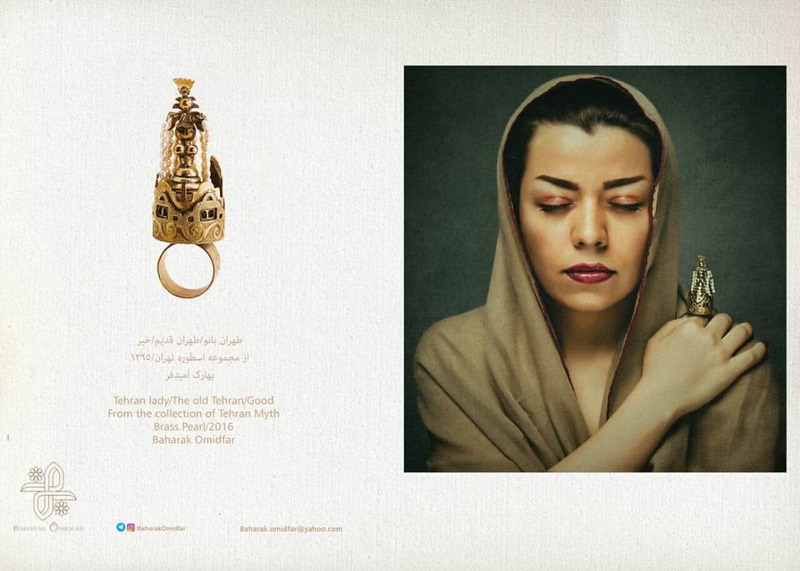 She has participated in many jewellery fairs in Iran, Germany and France. 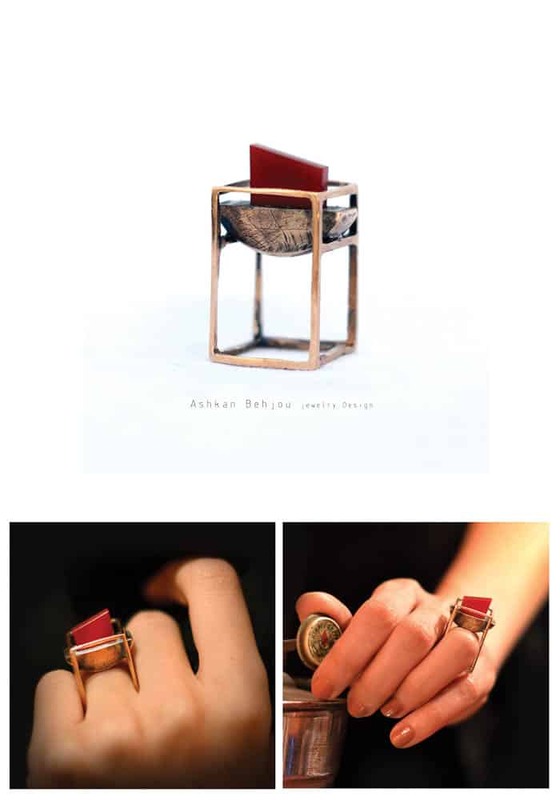 She has a Unesco Award of Excellence for Handicrafts in 2012 and her works were selected of Bēhance Portfolio Reviews in part of Fashion (jewellery design) in 2015. When I was a child, I used to characterise the things that belonged and mattered to me. It was me, my imaginary world and the pure feelings that I felt. As I grew up, little by little, I came to the conclusion that most of the emotions in people’s world are the same despite where they are living in. So, imagine sitting in your favorite chair looking at a nice view on a bright spring day, wondering in your wonderland and thinking that there might be another side to discover… That is when my magic begins! 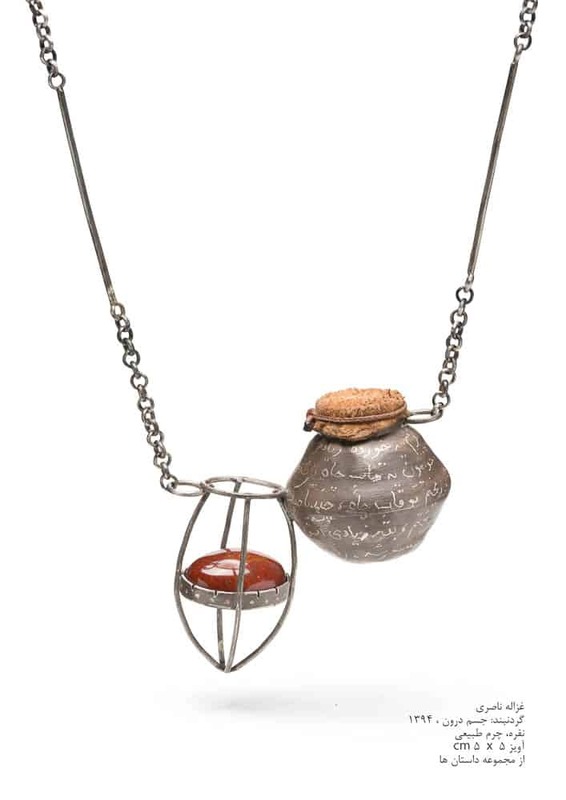 My jewelleries are my precious personal experience about my surroundings and they contain stories. They are built up slowly as I go deeper inside myself. Creating my jewellery is the first chapter of the story and it will continue as people wear my creations in different moments of life and the last chapters of their stories are yet to be revealed. 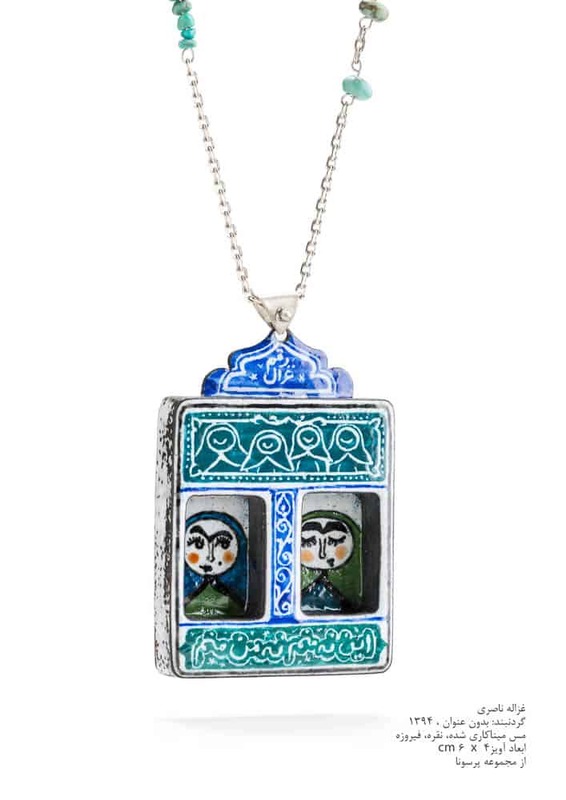 Ghazaleh Nasseri, born on 1988, the owner of Ghazaal Jewelry brand, is a pioneer artist in designing and making enamel jewellery. Her unique creations are far beyond being ordinary necklaces, bracelets, and earrings; they are marvellous wearable sculptures with lively colours that blend Persian traditional arts with modern arts and bring pure aesthetics into our everyday lives. 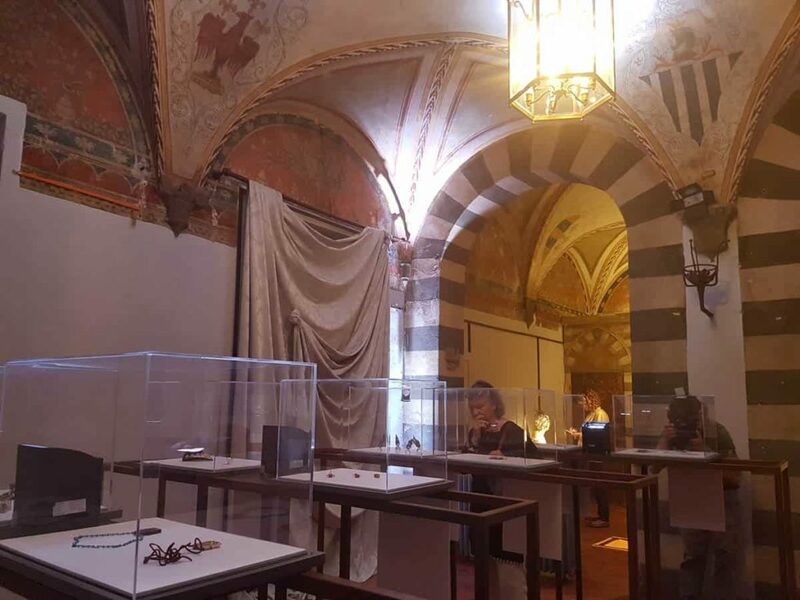 During the past six years, she has gained a lot of experience in enamelling techniques and making metal jewellery with copper, brass, silver and gold. 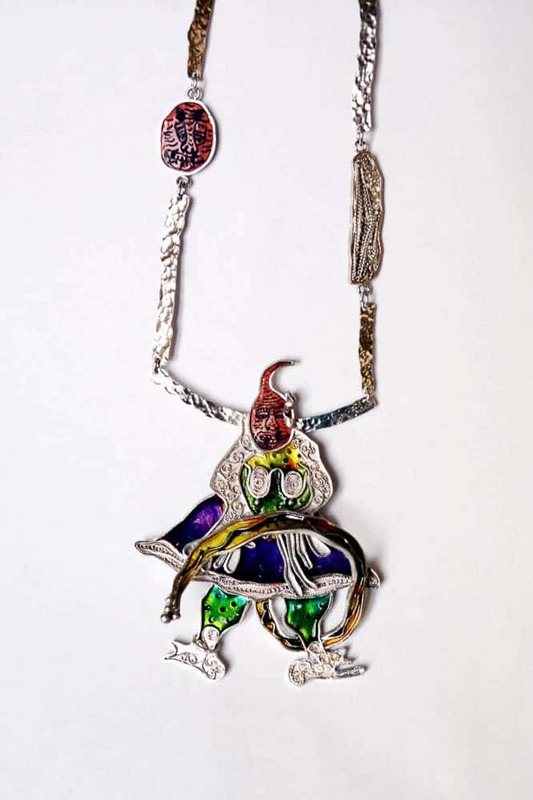 In January 2013, she had her first solo exhibition of enamel jewellery. After receiving her Master’s degree in Fine Arts from the Art University Of Tehran, she began to research Persian folk culture. 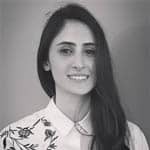 Her pieces are mainly inspired by Persian folk stories, Qajar iconography, and pop arts, and emphasise the past, current, and future role of women in society. “When man was born, he had no imagination of the world; he was without any knowledge. 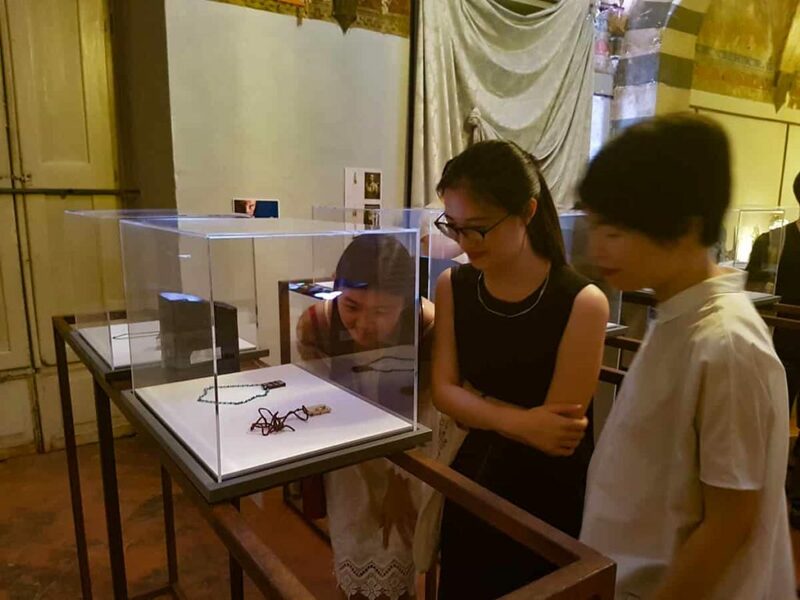 Man learns to distinguish what is natural from what it is not; therefore, it passes from an absolutely natural state to a cultural point of view. In fact, man is a cultural product, but he feels the need to distance himself from the knowledge has already written; to align with his being and his nature, between his past and his imagination, in a quixotic fusion between cognition and creation. 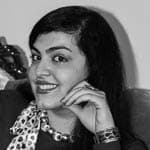 Mahnaz Seyed Ekhtiary is a contemporary designer-artist. She was born in 1985, Tehran. 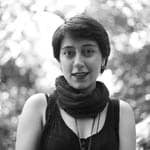 After the Diploma in Graphic Design at the School of Visual Arts in Tehran, she graduated from the University of Art in Al-Zahra in 2008, specialising in the “Artwear” sector. 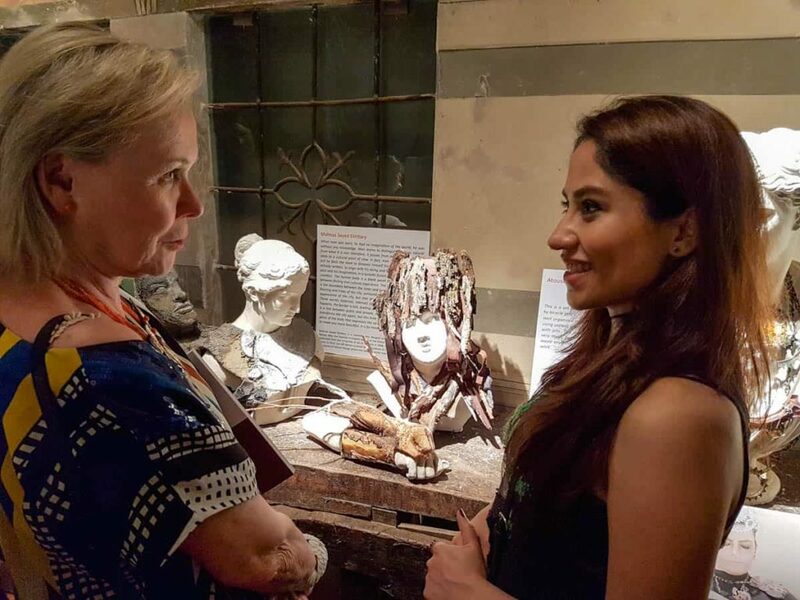 In 2013, she left Tehran to enroll at the Academy of Fine Arts of Brera in Milan in the course of Fashion Design where she lives and works now. 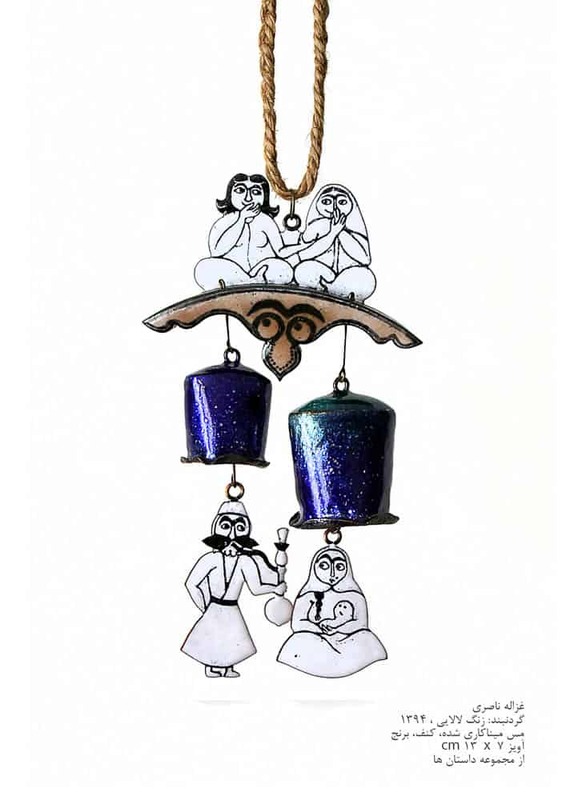 Rose & Nightingale is an important topic in oriental art, especially Persian art. Rose & Nightingale represent the loved and the lover. In my work, rose is symbol of female and bird is symbol of male. Usually love embraces the lover, but unfortunately little by little this love limits the female and puts her under pressure. So the rose will be dry. 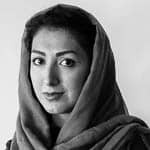 Narges Asadinejad was born in 1985 and graduated handicraft specialising in jewellery from Art University of Tehran in 2009 and then did postgraduate degree Persian painting in Islamic art from Tarbiatmodares University, Tehran, 2013. Just like colour in painting, filigree and enamel is the means to express my art. I had an opportunity in university to find out some of my works have a similar essence to the illustrations in Shah Name Tahmasbi. 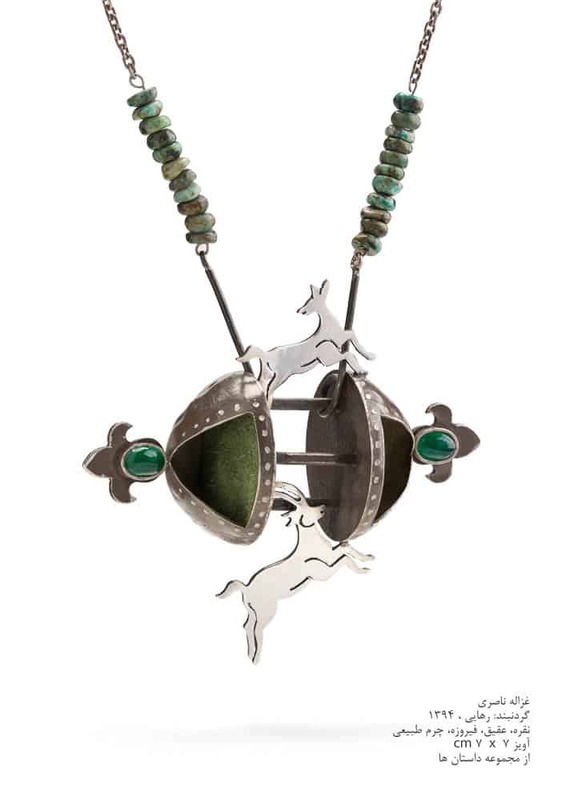 Each jewel that I use is a part of a narration that will reveal its meaning in the whole body of a work. Nikoo Nooriya has lived in Tehran since birth. She completed a Handicrafts Master degree from Soore Art University. Now, she is working on jewelry design and painting in her own studio. The sources of inspiration have been her own paintings and illustrations of Shahnameh. 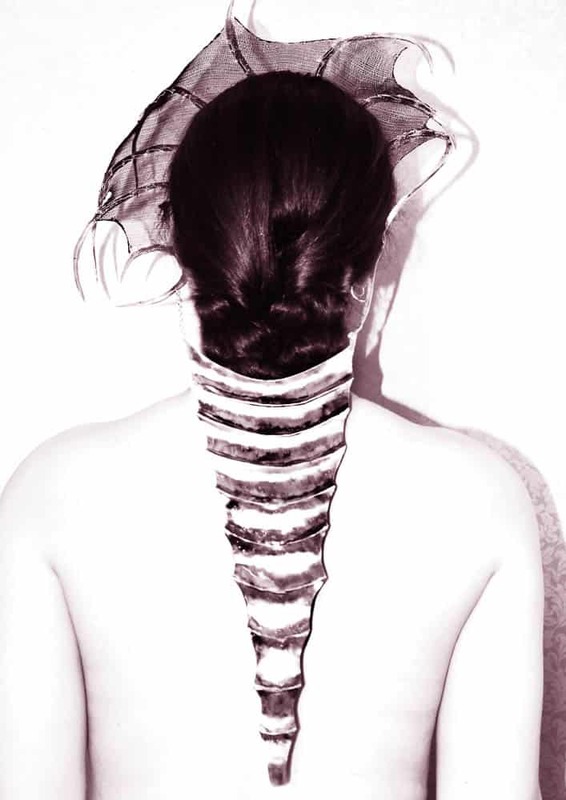 Niloofar Naadi The fish skeleton is inspired by the south of Iran, on the Persian Gulf. 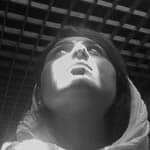 Niloofar Naadi was born in 1988 in Tehran. 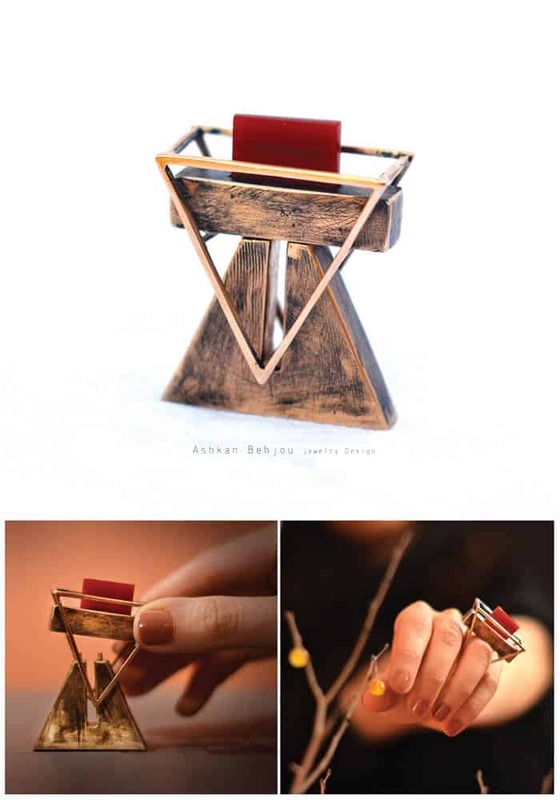 With her sister, she designs and makes jewellery in their private workshop with stone, shell, wood and leather. 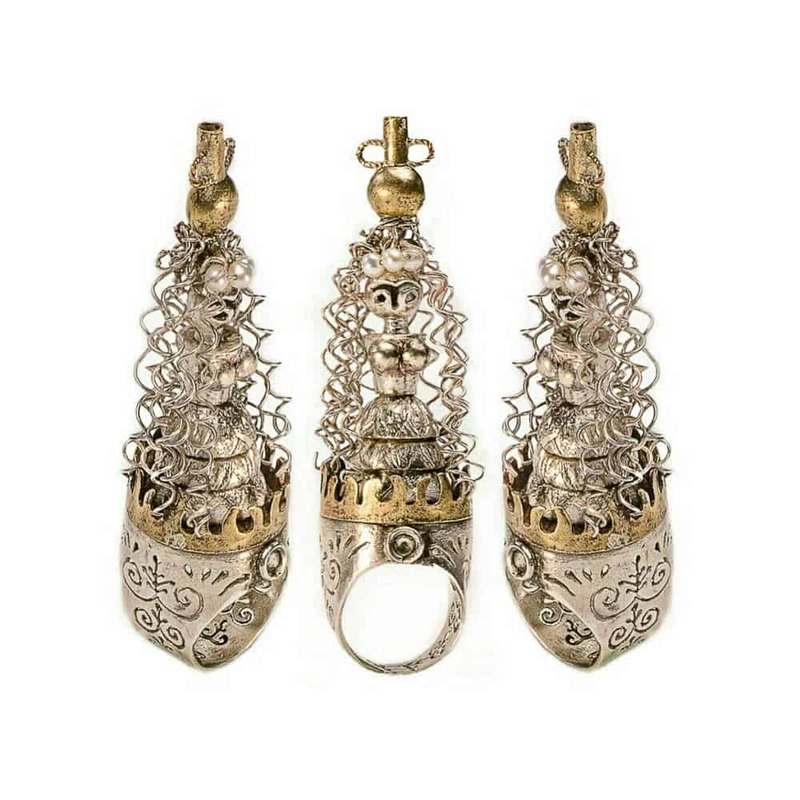 The name of their brand is “Shamash”, which means “god of the sun”. 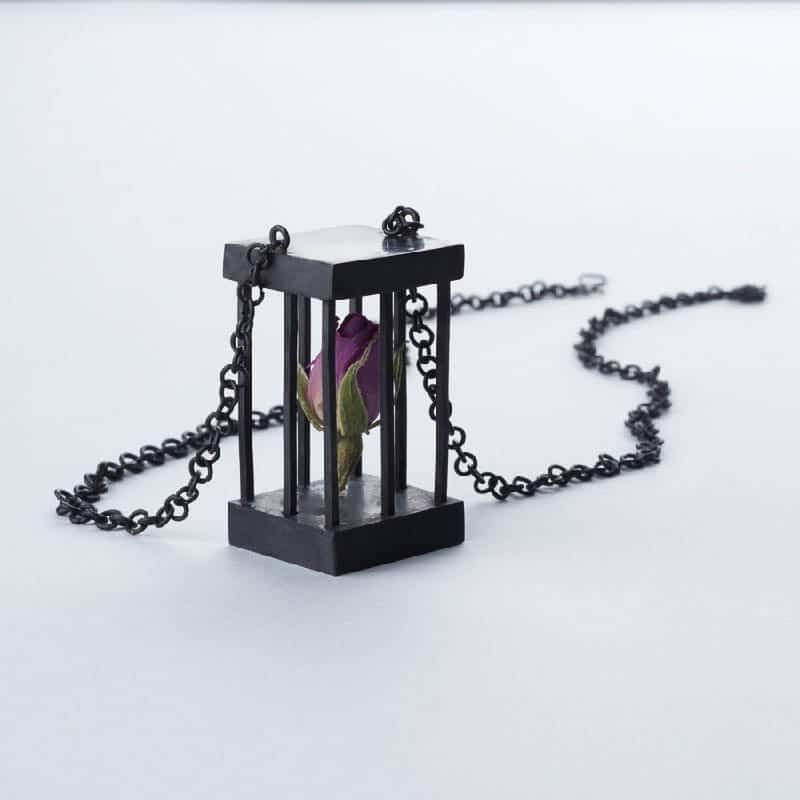 Sometimes protection and attention can make a cage, a beautiful cage. We are imprisoned in it. It is as if we are free, but our hands are not! And the gradual suffocation makes us suffer. It is a kind of restricted freedom that cannot lead to true liberation. And this is worse and more painful than limitation itself. I have in mind the situation of some woman in Iran who might be in this condition even in the best and freest way they live, whether attached to family (parents) or their partner/ husbands. Their freedom is conditioned. They are told, “You are free under this or that condition.” This very behaviour contradicts the whole concept of freedom. Saeedeh Davudi was born and lives in Tehran. 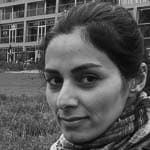 She recently graduated from Tehran University of Art in textile design. 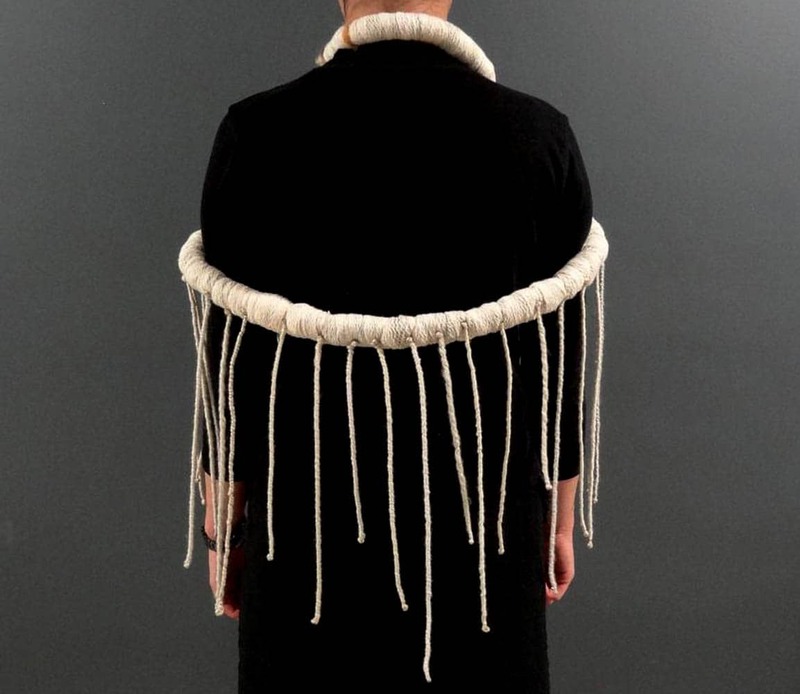 She worked on fabric jewellery for her final project and used felt in some of those works. 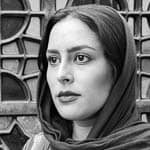 Shahrzad Aliyari Maleki, Break the locks of prison with an ax – when you broke the prison, you will be all king and prince) is from Iranian poet Mowlavi and is about this work. 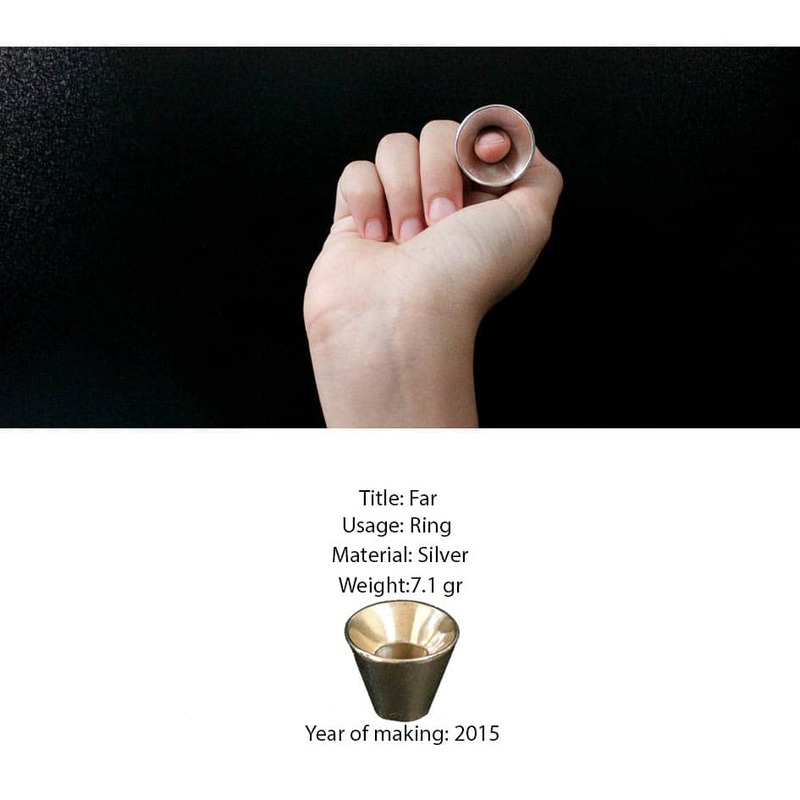 I use different metals to make my ergonomic designs and contemporary jewellery. The making process in work’s formation helps to develop the design. 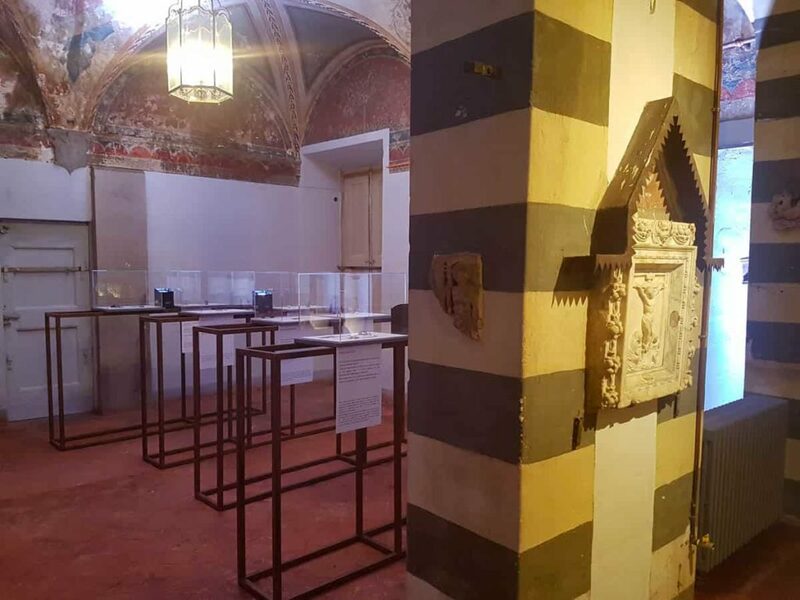 The internal and external spaces with holes and other visual qualities make the works mysterious and multilayered. 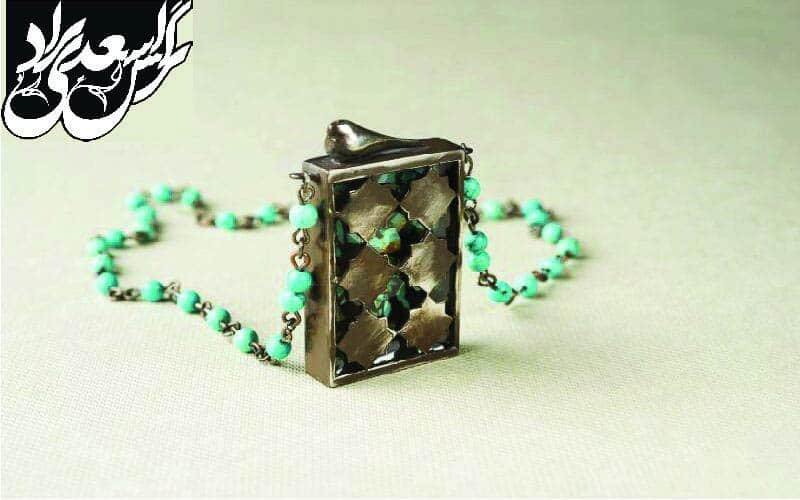 Generally, the forms are symbols of Iranian architecture and the holes are symbols of stones on the jewellery. I focus particularly on the point finger and the fingertip. 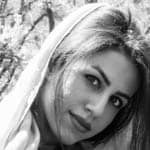 Shahrzad Aliyari Maleki was born in 1984. 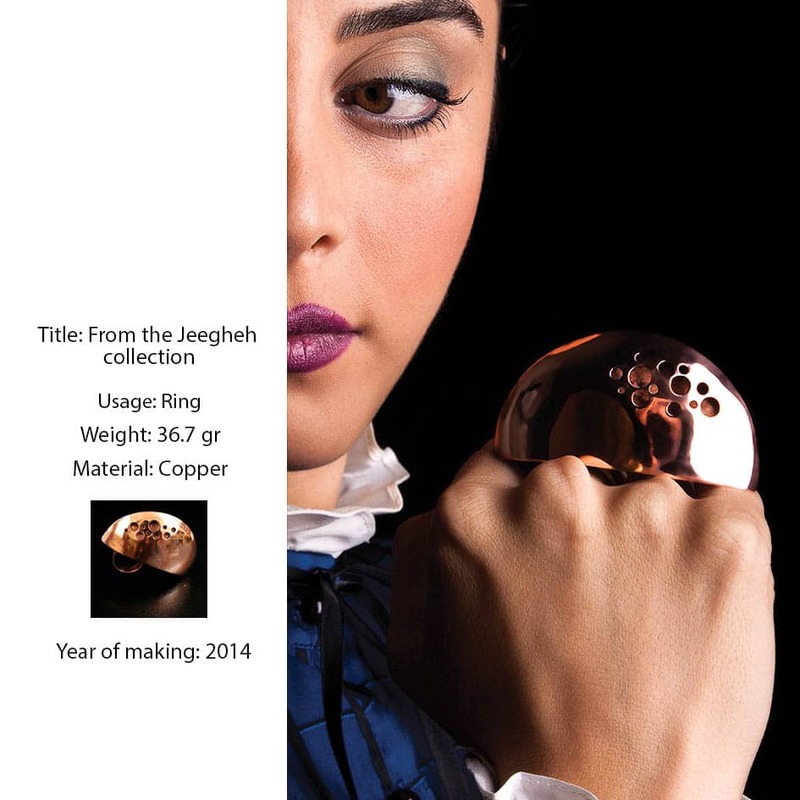 She is a contemporary jewellery designer living Karaj, Iran. 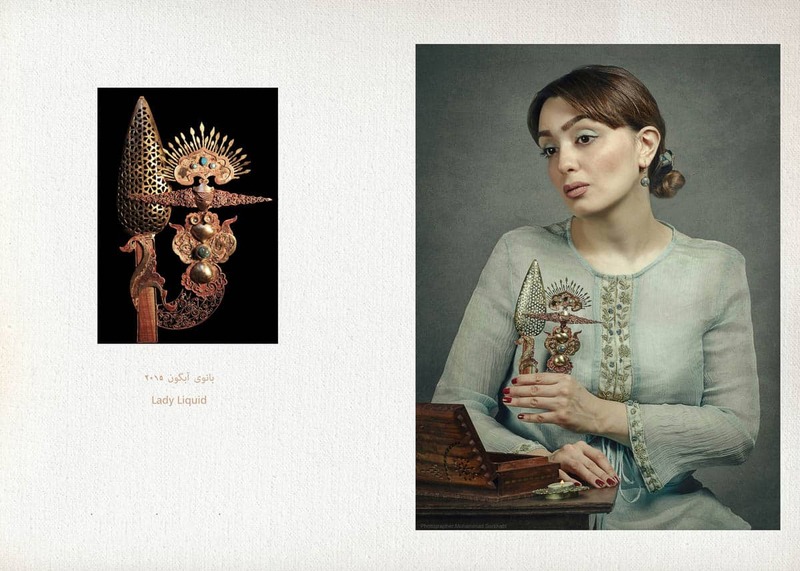 She graduated in Islamic metal arts major (BA) from Islamic Art University of Tabriz, Iran. 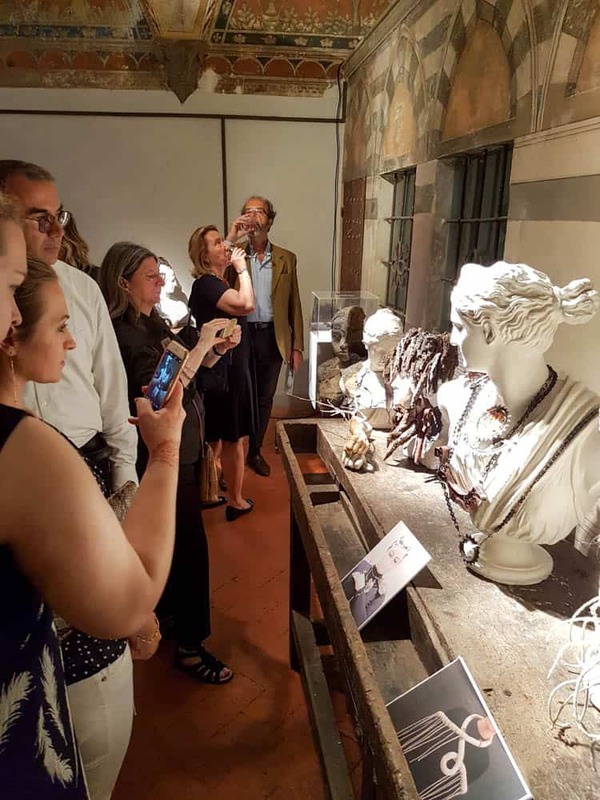 For the creation of my artwork, I get my inspiration from the culture of the Iranian people and their various lifestyles throughout history as well as the present. I’ve used old and recent photos of the city of Tehran and combined them with colours that represent the new generation and their potential to create conceptual art pieces. 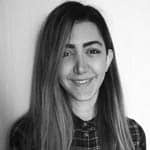 Sharmagh Estkandarian is Armenian and was born and raised in Tehran. 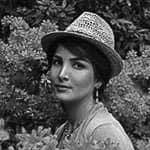 She was interested in art from very young age and started thinking of ideas and creations before going to the Art University of Tehran. Now she has her own brand of handmade jewellery. 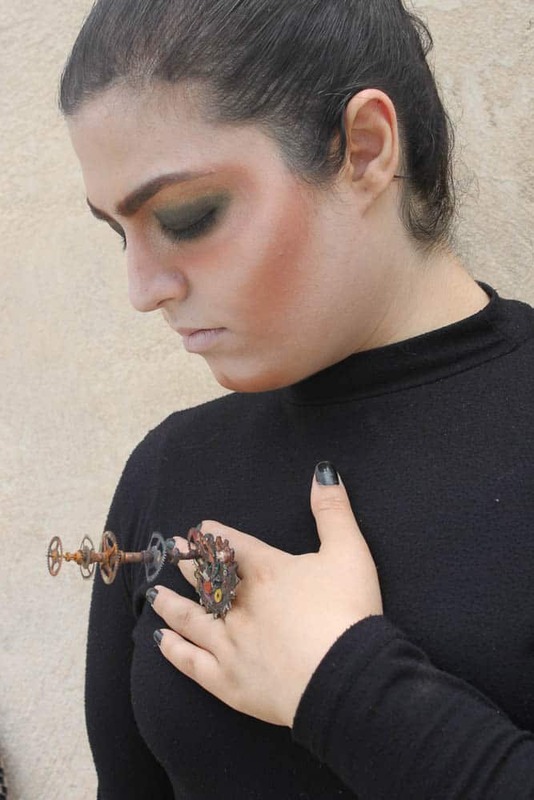 The purpose of creating this piece of jewellery was to introduce people to Armenian traditional clothing and culture. In this piece we’re showing Armenian traditional clothing that is called “Taraz”. In the background, we used a picture of Ararat Mountains that represent one of the main images of our ancient country. 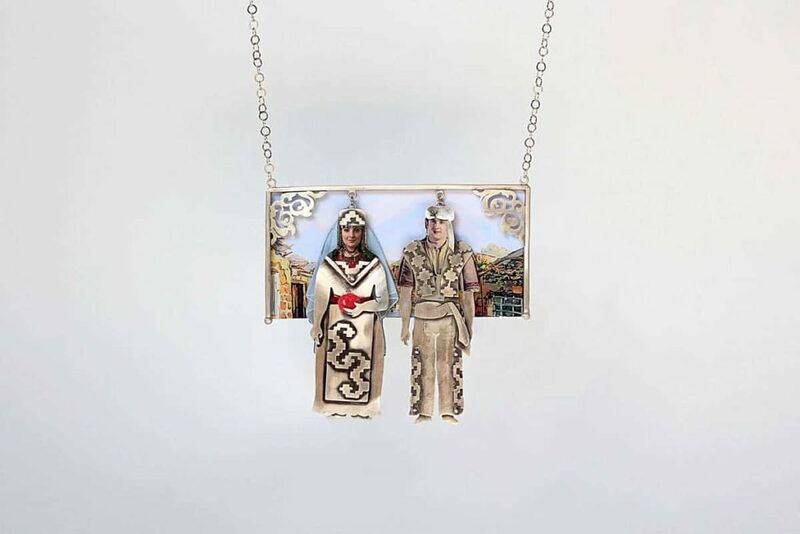 In the process of designing and making this art piece we used silver because it is the material that most of the Armenian metalworkers use it to create art pieces. Beaina Minasvand is Armenian, but she was born and raised in Iran. 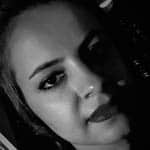 She loved art from the very young age and had the chance to continue her life in that field by going to Alzahra Art University. 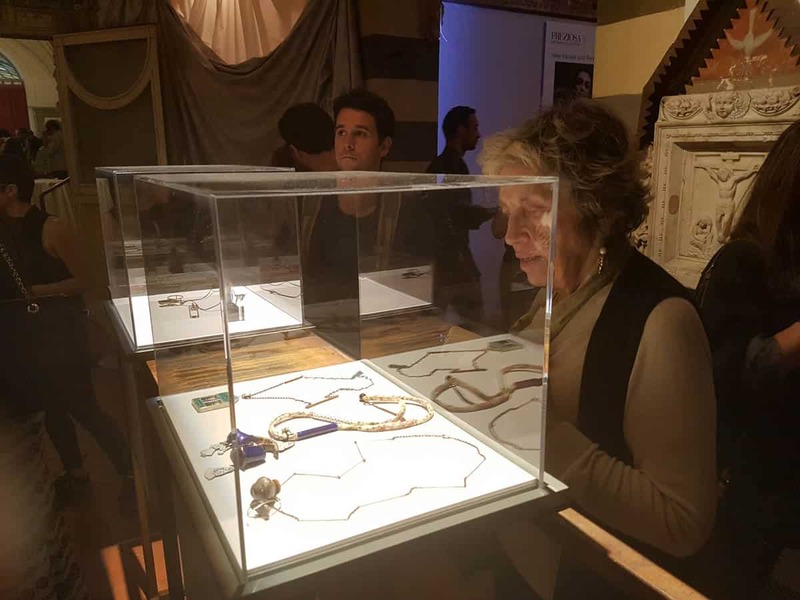 Now she is designing and making jewels using Iranian and Armenian traditional patterns. Mehrnoosh Ganji was born in Iran (1979) and completed a a degree in Industrial Design from The University of Tehran. She emigrated to Australia in 2012 and completed an Advanced Diploma in Jewellery at Melbourne Polytechnic (NMIT) in 2014. Her design philosophy is to create pieces that are not only eye-catching, but also functional, even playful. 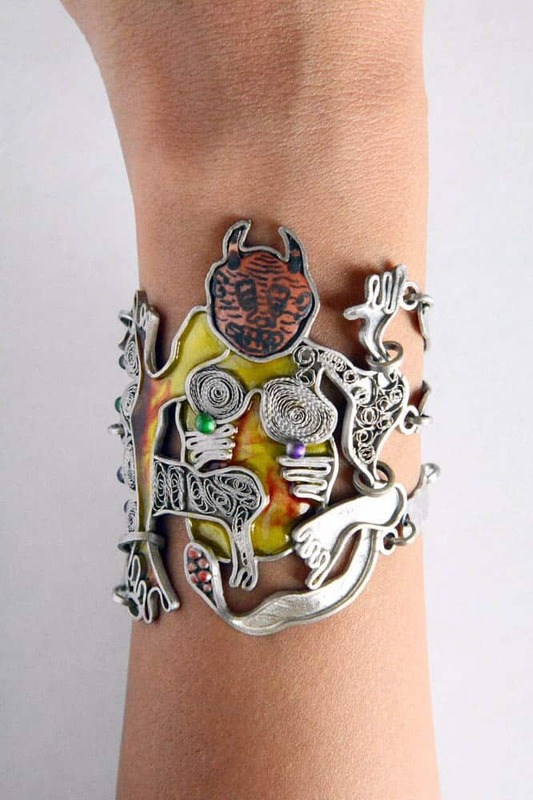 She likes the wearer to communicate with her designed piece. 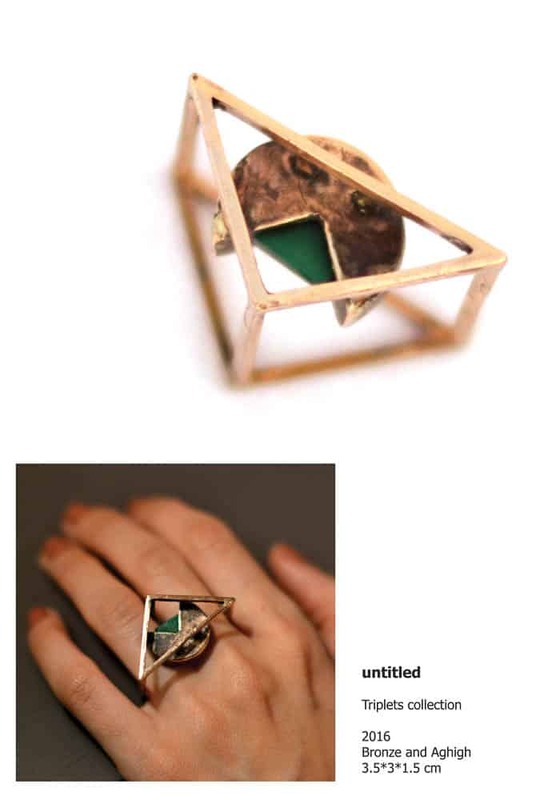 So, she designs multifunctional pieces that have theme and tell stories and encourage wearer to discover this story. 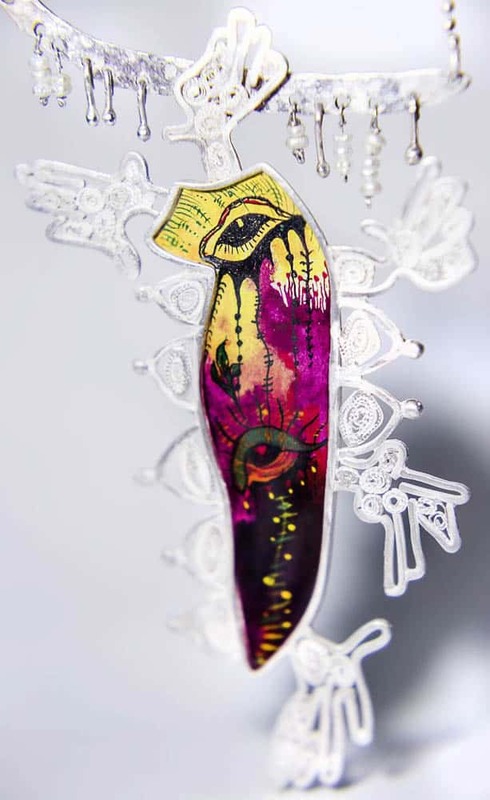 She likes to create correlation between the eastern and western culture in her works as well as using traditional techniques and forms to create contemporary jewellery. 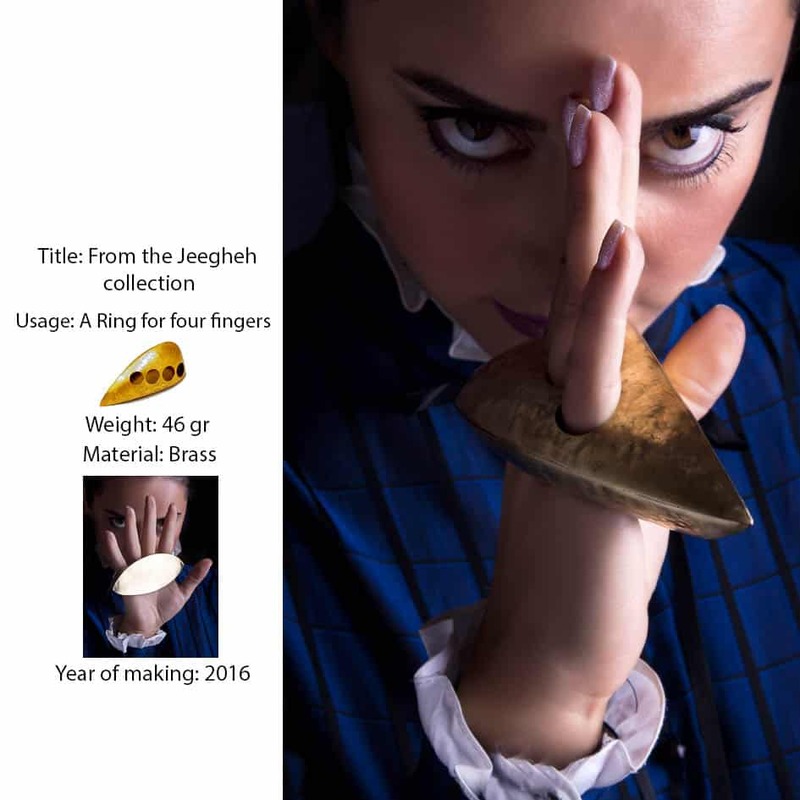 The work of Mehrnoosh Ganji is presented as an example of Iranian jewellery produced by the generation who have migrated and look back longingly to their heritage. For more information about this work, see the A Pomegranate’s Secret.